On Christmas Day when dawn broke it was very foggy so we were able to have a short run on top of the trenches to get us warm. Anyhow the fog lifted and our men as well as the Germans were expected to fire but none fired. Then the Germans started to wave umbrellas and rifles, we answering. They sang and we sang. Then getting bolder, we advanced twards their trenches, they leaving theirs, both parties unarmed. When we met we found they were fairly old fellows. We exchanged greetings, they gave us sausages, cigars, cigs, sweets and parkin. We all mixed up together and men played mouth organs and tin whistles and danced, and my word the Germans can’t just sing. Some of them exchanged addresses and souvenirs were freely exchanged. The time came when we had to part. Shaking hands and shouting, they and we went back to the trenches. No firing was done on Christmas Day making it a peaceful day. What is clear is that the truces in 1914 were localised and spontaneous, and were ‘grassroots’ – indeed they were frowned on by many officers. Authorities made sure the truce was not repeated in later war years. 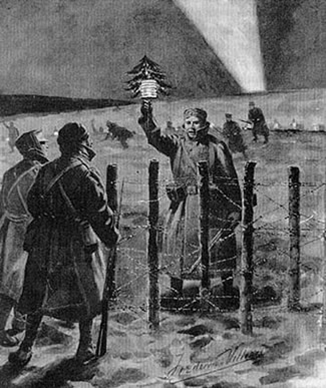 In many places it was initiated by the German soldiers – ‘the enemy’ took the first steps. Everyday people were prepared on this holy day to cross boundaries, shake hands with enemies, share the joy of the day with music and dancing – and to live with the hope that the friendship formed may continue – addresses were exchanged. One [German soldier] has given me his address to write to him after the war. They were quite a decent lot of fellows I can tell you. I know this seems an unbelievable story but it is fact. I am sure if it was left to the men there would be no war. Today – Let us pray for the courage to respond to friendship offered even if it comes from unusual places. May we, for the sake of peace, be prepared to step over human boundaries, celebrate religious feasts with others, and offer signs of harmony and joy even if authority disapproves. 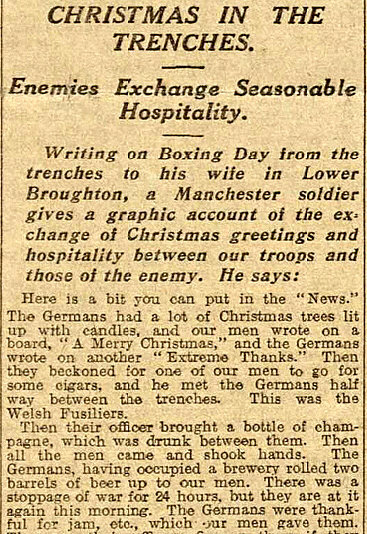 This entry was posted in Anglican, Catholic, Christianity, Faith, Manchester, Prayer and tagged Christmas, Christmas Truce, First World War, Stockport. Bookmark the permalink.